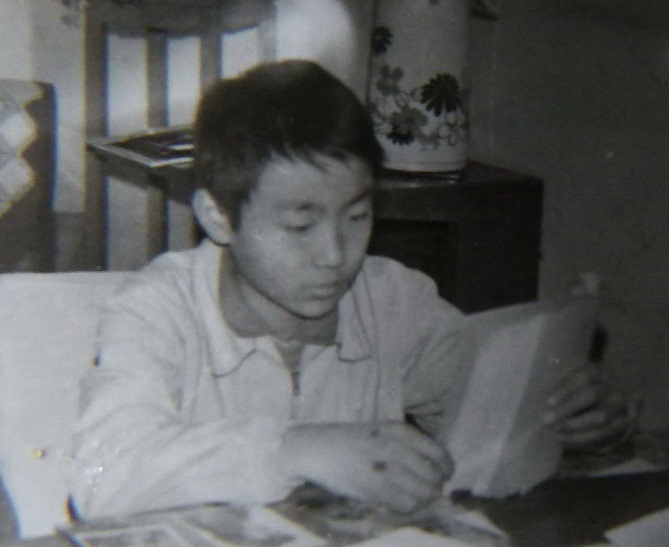 Twenty-five years after June Fourth, I quiet my heart to remember Jielian’s (蒋捷连) short life, feeling that this child’s time in this world was both fortunate and unfortunate. He was born in 1972, during the mid to late stages of the Cultural Revolution, and grew up during the 1980s. This was a happy decade—a period in which he was fortunate enough to have grown up, maturing from a child to a youth. Those ten years, you could say were a rare and fortunate period in the hundreds of years of modern history of our troubled country and people. Order emerged out of chaos, thought was liberated, speech opened up, and controls were relaxed. People were thirsty for reform, with an undisguised yearning for Western freedom and democracy. Day by day, Jielian grew up in this kind of atmosphere, absorbing the new ideas as if he were a sponge. Moreover, we, with our special family background—his father, Jiang Peikun (蒋培坤) taught aesthetic principles and I taught Western aesthetics—were among the first to come into contact with all kinds of ideas from the West. Renmin University’s buildings were in short supply. Faculty members did not have offices. Besides lecturing in classrooms, we usually prepared for class, advised graduate students, and even held department meetings in our homes. So, there was usually an endless stream of people—colleagues and students—coming and going at our home. The atmosphere of discussion was passionate. It was like a distribution center for all kinds of ideas, with the flavor of a salon. Whatever speeches or article-type materials came into the household, Jielian always rushed to read them first, ten lines at a glance, swallowing them whole. And when he came home from school, he would catch the intense debates and enthusiastic discussions and always quietly listen, half understanding, in the small room next door. In the first half of the 1980s, there were two things that had the greatest impact on him. The first occurred in the early 1980s. The nation’s gates had just opened up. Ms. Shi Jizhao, a doctor and researcher at Union Hospital and the sister of my seventh aunt Ms. Shi Jiying, was lucky enough to become the earliest visiting scholar to the United States. When she came back, she brought back the Biography of Ding Wenjiang—my uncle—written by Mr. Hu Shi,  given to her as a gift from Mr. Hu’s son. At that time on the mainland, Hu Shi and Ding Wenjiang were still branded as agents of Western culture. Although family members viewed this biography as a treasure, no one dared make it known publicly. We only secretly circulated it among Ding’s immediate family. When it came to my family, naturally it was Jielian who was the first to read it. His father simply took apart the copy so that the three of us could read different parts at the same time through the night. After we had finished, we stitched the book back together. It was this biography that made me reflect upon and gain a new understanding of my own uncle and the clan into which I was born. At that time, for many days in a row I used my spare time searching among the dust in the library, collecting the written traces related to Ding Wenjiang, photocopying them, bringing them home, and studying them carefully. Jielian witnessed the many hardships I went through in searching for my uncle’s cemetery that had been destroyed during the Cultural Revolution period, and later, contacting the grave restorers and preparing a commemoration. It was Ding Wenjiang’s true love for his country and people and his intense sense of responsibility that deeply influenced our whole family. Our two children were very fortunate to have seen it all with their own eyes. Our elder son assisted me in translating Ms. Charlotte Furth’s book, Ting Wen-chiang: Science and China's New Culture, and Jiang, my husband, edited the translation for us. Then Jielian was the first reader, reading it chapter by chapter as we completed the translation. For a 14-year-old child to be able to understand this kind of book, translated from another world, was not easy. The second was the student protests of 1986. These two things occurred at almost the same time. At that time, Mr. Fang Lizhi, Vice President of the University of Science and Technology of China, had openly promoted ideas such as freedom, democracy, and human rights through his speeches at various universities including Zhejiang University, Shanghai Jiaotong University, and his own. His speeches were widely circulated among teachers and students. He believed that one could not just count on democracy to come from “above,” because “the democracy that is bestowed from above is not true democracy.” He advocated independence in academic thinking, and a struggle for freedom and respect for human rights in politics. These ideas were very influential among Chinese intellectuals at that time. Aside from Fang Lizhi, there were several others, such as Wang Ruowang in Shanghai and Liu Binyan and Wang Ruoshui in Beijing, who were greatly influential. In late 1986 to early 1987, “pro-democracy, pro-freedom, anti-profiteering, anti-corruption” student protests broke out in close succession in more than ten universities across the country, including in Anhui, Shanghai, and Beijing. It should be said that this was the inevitable result of the introduction of Western thought in China in the 1980s. At that time, Mr. Hu Yaobang served as General Secretary of the Communist Party of China. He advocated not to use force to suppress the student protests, but rather use dialogue and persuasion to calm them. But Party elders such as Deng Xiaoping, Bo Yibo, etc., blamed the outbreak of the student protests on the instigation of liberal intellectuals and the indulgence of Hu Yaobang. These student protests also influenced some high schools in Beijing’s western suburb university district, such as the High School Affiliated to Renmin University of China and the Affiliated High School of Peking University. Jielian, with his sensitivity to ideas, frequently braved the bitter cold to go to various universities to listen to speeches and copy big-character posters, in order to understand the situation of the student movement. One evening, he didn’t come home after school. We waited until very, very late, and he finally came home. We asked him which classmate’s house he had gone to, he said he had not gone to a classmate’s house. We asked again, and he finally reluctantly said that he had gone marching with a team of students from Beijing University. At that time, he was not yet fifteen years old, still a child! Although these student protests were short in duration, obstinate elders within the Communist Party of China such as Deng Xiaoping quickly used extraordinary measures to force Hu Yaobang to resign in 1987 (his retirement would lead to his premature death two years later). The impact was far reaching. The teachers and students who pursued democracy and freedom felt that Hu’s removal was unjust. In the study and living room of our home we, still passionately and excitedly discussed the important affairs of the state. After the student protests, Jielian threw himself into his daily studies, preparing for the upcoming zhongkao (high school entrance examination). However, the seeds of fire of democracy had already taken root in his tender soul, heralding his later participation in the 1989 student movement. But, we also must face this cruel reality: Jielian was unfortunate. Such a youth, vigorous and lively, passionate about life and living, kind-hearted, just starting out along life’s journey, was shot dead by the country and army he so fervently loved. Unarmed and defenseless, as he was hit on Shili Chang Street and fell in a pool of blood, he was still thinking that he was hit with rubber bullets. He was dead in an instant. Now when I hear “post-1970,” “post-1980,” “post-1990” (referring to generations born in those decades), I frequently feel heart palpitations. My Jielian was of the post-1970 generation, highly intelligent, brimming over with talent. This world should have been his, but he ended up dead, without a trace of remorse or an apology from the authorities who killed him, and with his parents being subjected to monitoring and persecution. Living in this period, the 1980s—was it fortunate or unfortunate after all? After the student protests, he was just like before, throwing himself into his daily studies. Editor’s note: This is an edited version of Part 11 of a 14-part essay. Click here to read the entire essay in Chinese. Ding Wenjiang (丁文江) was a Chinese geologist and social activist. Hu Shi (胡适) was a Chinese philosopher, diplomat, and former president of Peking University. He was a key contributor to Chinese liberalism and language reform, influential in the May Fourth Movement, and a leader of China's New Culture Movement in early 20th century.